Hope you found delight in the detour! This chapter puts us back on track toward developing a brand-new tool of logic: Quadernity’s Nature-Based Number Line! Mathematics is the science of patterns and relationships. Exposure to mathematical principles informs the logic that we automatically/instinctively tap whenever we assess our personal relationships, anticipate causes and effects of the phenomena around us, or attempt to solve problems. Have you ever wondered why being “debt free” is a goal to strive for when it simply indicates that one’s assets and debts cancel to net-zero? Ever wonder why having less than zero (debt exceeds assets) is a condition accepted by most working families, and by the United States government (trillions of dollars in debt)? Have you ever wondered why we take for granted that we must compete for everything (job/promotion/raise, a friend/date/life-partner, admission to pre-school/private-school/college, acceptance by doctors/insurance companies for necessary health care, and in many cases just for resources to survive and provide for family)? Have you ever wondered why we need three kinds of physicists: one studies the really small stuff (Quantum Mechanics), one studies the medium sized stuff (Classical Physics) and yet another studies the really big stuff (General Relativity)? Ever wondered how, when we walk across the room, all our physical molecules and metaphysical memories come right along with us? The current number line is centered on zero, making negative numbers seem just as useful and commonplace as positive numbers. This is misleading because Nature needs no negative numbers. Negative numbers are needed only to count debt! The current number line implies adding = winning = advancing positively, while subtracting = losing = retreating negatively. Our economy is based on limited resources of which there are not enough to go around. Those who have/do/get more appear to be better off. Zero Sum Games have win-lose outcomes, never win-win outcomes. Not all effects are locally caused; and not all effects are proportional to the direct forces thought to have caused them. Each unit on the standard number line represents an equivalent digital/static event/condition/entity, while neglecting the vastly more common analogue/continuous processes. The old number line fails to represent the non-linear/exponential changes that are happening all around us; instead, its changes/movements in either direction are always linear/proportional. Because of our limited logic, derived from the inadequate number line, we continue to be confused or surprised by critical mass shifts and phase changes, which are commonplace across all scales. 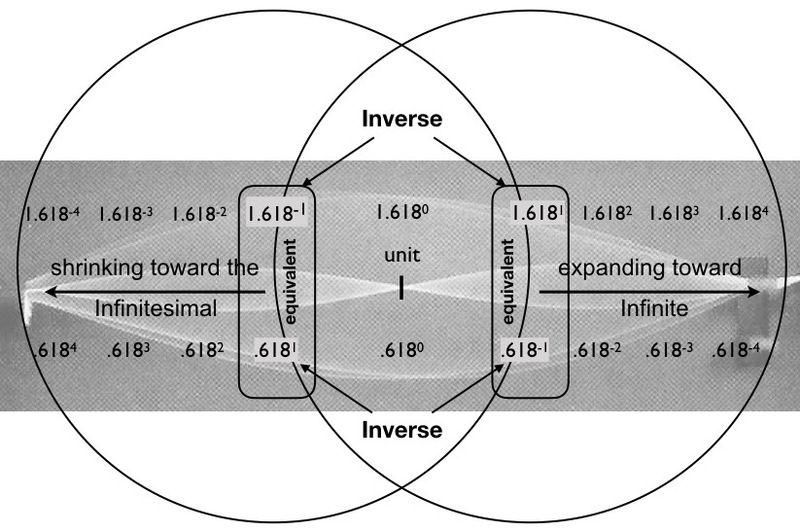 The current number line does not represent nature’s hierarchical organization, where each dimension transcends and includes those within/before; therefore, it cannot seamlessly inter-connect the Parts (descending in scale to an infinitesimal size) and the Participation (ascending in scale to the infinitely large) of any selected Particularity (unit 1) to which they are related. This inadequacy leaves us with the false impression that isolated occurrences are not only possible, but ordinary. Having been under the influence of a fundamentally deficient mathematical logic since we were kids, we have collectively come to accept perverted norms. Current issues involve non-local causality, non-linear cause-effect relationships and complex dynamical systems, none of which has a solution that could arise from our current mathematical intuition. evaluating outcomes of cooperation vs. competition in biological evolution. If the above list feels foreign to you, you are not alone. The near exclusive dependency on linear thinking develops a lop-sided logic that has little to do with nature or the cosmos. Having the vast majority of our citizenry relegated to such a limited logic has insidious effects. Few of us are able to adequately anticipate, prepare for, or solve the pressing problems of today — those that our young students will inherit all too soon. Linear thinking is passé; it misleads us intuitively, and it intellectually inhibits our progress. Linear thinking must be compared to and contrasted with non-linear thinking as early in life as possible! Click this link to an easy little video that compares and contrasts linear and non-linear relationships. Our new, natural number line needs to correlate with what we learned from The Cylindrical Lattice Model of Quadernity, which illustrates how the immediate experiences of our direct/local connections are surrounded by indirect/non-local connections, both inside/within us and outside/beyond us. These interconnections both precede and project our existence as a Particular Entity (or Particularity). In a previous aside The Holarchy we were introduced to the word ‘holon‘, a term coined by Arthur Koestler to describe how wholes are made of parts, and wholes are also parts of other wholes. Described in the language of Quadernity: a particular entity, a.k.a. a Particularity, comprises smaller, simpler Parts within itself, while also Participating as a Part in more complex wholes beyond itself. The selection of a Particularity renders it the unit of relativity; in other words, it provides the orientation necessary for the descriptors: inside and outside. Anything can be declared the Particularity; below one of the Matryoshka dolls is selected at random. Theoretically speaking, the number of dolls to the left (think inside) of the designee is unlimited. Each doll gets smaller than the one before it. 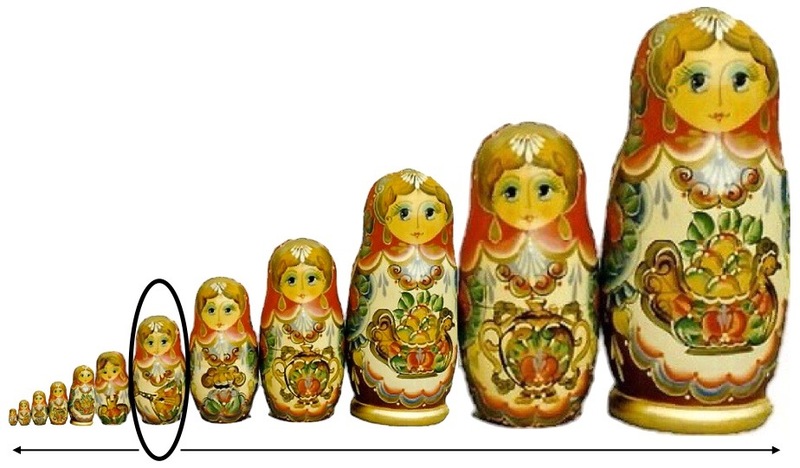 Also, the number of dolls to her right (think outside) are unlimited, each one getting larger than the one before it. In an ongoing progression, the selected Particularity is midway between an infinity of smaller and smaller Parts and an infinity of larger and larger wholes. The inversion from inner to outer takes place at the central unit, as the Particularity is singled-out. What are the numerical values that represent internal Parts and approach the infinitesimal (too small to count, imperceptible) at the left-most edge? And what are the numerical values that represent external Participation and approach infinity (too big to count, innumerable) at the right-most edge? In Discovering Portals between Dimensions, the question was posed, “What numbers are inverse of each other and differ by ‘1’?” Mathematically, this question is stated: n – 1 = 1/n. The world as we know it has no negative things; so, for the purposes of our nature-based number line, we will focus on the positive solution and its inverse: 1.618 (Phi) and .618 (phi). 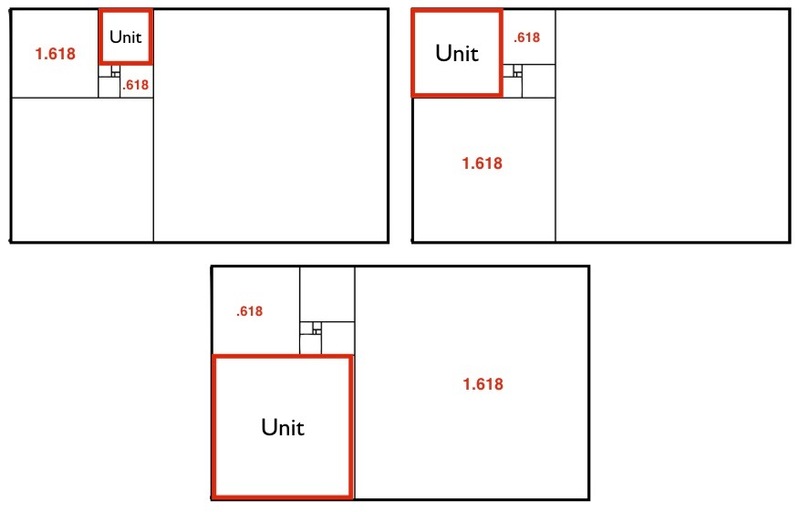 Select any square within the Golden Rectangle and assign its side lengths the Unit value ‘1’. The next smaller square will have side lengths of .618 (phi) and the next larger square will have side lengths of 1.618 (Phi). The numbers have been truncated at three decimals below and rounded off at nine decimals above. In actuality, the numbers are irrational, meaning that their decimals never end, nor do they ever repeat a pattern. Understanding this, we can populate a Pragmatic Schematic with numerical values that, in the right crescent, represent the squares getting smaller toward the inside, and, in the left crescent, represent the squares getting larger toward the outside. Traditionally, exponents of +1 are not shown because they do not affect the value of the base number. Regardless, in an effort to make things simpler to follow, the positive exponent of 1 will be used to indicate 1.618, and an exponent of -1 will be used with that base of Phi to indicate the inverse value, which is .618 (phi). As previously advised, we will assume that every number has an imaginary positive one (+1) in front of it. If the base number (1.618) has an exponent with a + sign (as it does in the right crescent) we MULTIPLY the assumed +1 by the base number however many times the integer in the exponent tells us to (one time, two times, three times or four times). If the exponent has a – sign (as it does in the left crescent) we DIVIDE the assumed +1 by the base number (1.618) however many times the integer in the exponent tells us to. Ignoring for the moment the + or – signs, please notice that the integers increase sequentially from the center exponent of zero, whether moving to the right or to the left. The number of dimensions/scales on either side of the unit is a ‘countable’ infinity, meaning if you had all of eternity you could keep counting forever. For our purposes, however, only a finite four are displayed on each side. We remember that any base number with an exponent of zero has a value of one. This is because if we multiply the assumed +1 by any base number zero times, we still have +1. So when 1.618 has an exponent of zero it obtains the value of one, as we see it has in the central ‘mandorla’. The selected Particularity (the relative unit) is logically given a value of one. It would make no sense to give the unit of interest a value of zero, although the number line we learn in middle school is centered on zero, with positive whole numbers to the right and negative whole numbers to the left. This is suitable for the accounting concerns of profits and debts, though it fails to provide a seamless accounting of the full spectrum of interconnected scales/dimensions and therefore hampers the intuitive logic concerning natural phenomena. We do not attend to ‘nothings’; we attend to ‘somethings’. So, in our nature-based number line (centered on the unitary value of one) we bump the old number line (centered on zero) up to the level of exponents. In the graphic below, the inverse base number, ‘.618’, is also shown. It too has an exponent of zero. This gives it a unitary value, relative to the derivative values flowing from it in either direction. Notice how the exponents flip when the inverse base number is used. Now, positive exponents are in the left crescent and negative exponents are in the right crescent. The innermost columns are outlined. The highlighted values within the columns are equivalent. The same pattern of equivalency holds in all four columns on both sides of the central unit. The inverse of 1.618/1 is 1/1.618. The inverse of .618/1 = 1/.618. Any number divided by one is, of course, unchanged. 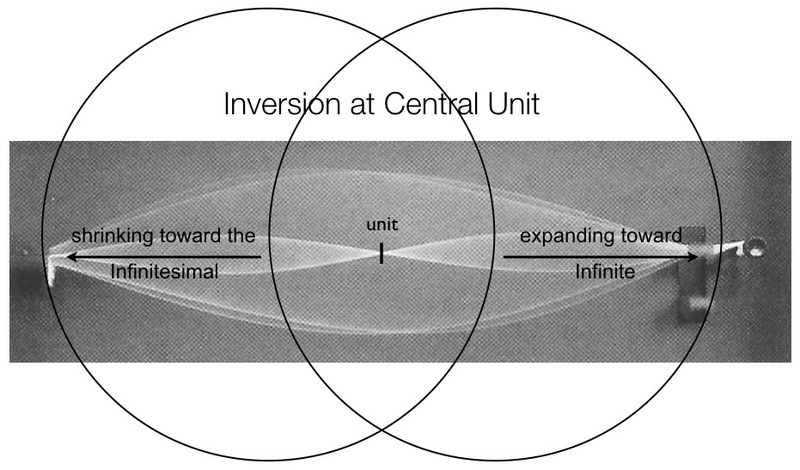 Even though showing a denominator of 1 is not commonplace, including it offers a visual aid for better comprehending the inversions. Where the denominators are ‘1’ (highlighted in red below) the values are equivalent to the numerator. Examples: 1.618/1 = 1.618 and .618/1 = .618. In the next graphic below, the red numbers (without their denominators of 1) are shown flanking the value of ONE, the ‘unit’ of whatever is encountered, or singled out. All values are proportional/relative to this selected Particularity. If something is smaller, or inside, its value is a fraction of one. If it is larger, or inclusive of the unit ‘1’, it will be a compound number, meaning the value will include the unit of 1 PLUS a fractional value. To the right and left of the unit value are the mystical numbers, Phi (1.618) and phi (.618). Phi and phi allow linear and exponential processes to run in parallel. Together, these three numbers (phi, ‘1’, and Phi) form a mathematical ‘trinity’. Proportionally, phi is to ‘1’ as ‘1’ is to Phi, making it possible to form a logarithmic scale. And, phi plus ‘1’ equals Phi, making it possible to form an additive summation series. The values increase from left to right in such a way that each number transcends and includes the numbers that came before it. 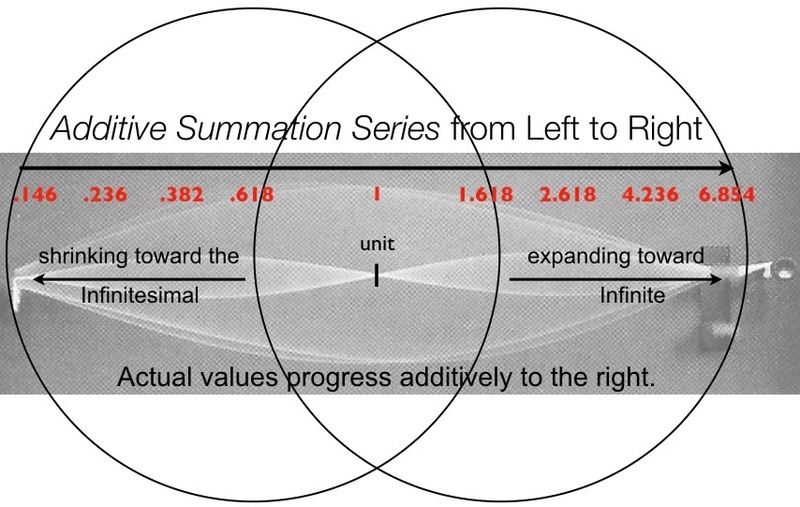 In the very short silent video offered here, you will see how the additive summation series unfolds. We first learned about the Parturient in the aside The Holarchy. If you need to refresh your memory, please review using the link, as that understanding is essential for what is revealed next. The graphic below comprises all that we have learned so far in this chapter about our new number line, plus some new labels in red. This graphic may look busy, but it is helpful for comprehension to have all the details in one place. If you would like to print it out for reference, click on the image and it will appear in a window by itself. Go to File, Print, and voila! For convenience as you scroll down, I will reprint the graphic every so often so you will have it always in sight for reference. 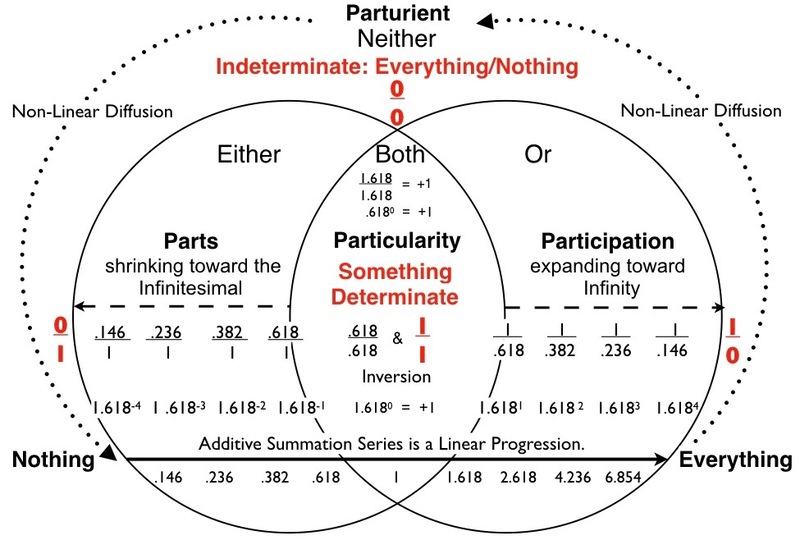 We know that the Parts get smaller and smaller, toward the infinitesimal (too small to count) and Participation in greater wholes grow more complex until they are too large to count (countable infinity can be counted, but only if you have eternity to keep counting). Both the shrinking fractions and growing complex numbers are bound within the circles, as they represent aspects of the selected Particularity 1/1 to which they are related. Beyond the infinitesimal is Nothingness, represented numerically as 0/1. Anything divided by 1 is left as it is, in this case ‘0’. Beyond the countable infinity is Everything, represented as 1/0. As 1 is divided by smaller and smaller numbers, the quotient grows larger and larger. If we could actually divide by 0, we would get Everything, an UNcountable Infinity. Nothing and Everything are unbounded. Moreover, they are indifferentiable. There is no place from which to comprehend Nothing because you would be something, which defies Nothingness. There is no place from which to comprehend Everything because you could not be beyond Everything or you would be something other than Everything and that would defy its Everythingness. The Particularity is the Determinate, meaning it has been determined by selection to be the value to which all the other bounded values are relevant. The Determinate is represented numerically as 1/1. In contrast, the Parturient is Indeterminate, meaning it cannot be determined. One of the axioms of mathematics says any number divided by itself equals 1. However, 0/0 is a nonsensical fraction, in that it is not possible to divide nothing by nothing. The Indeterminate is represented numerically by 0/0. There is an inversion of smaller Parts inside to larger wholes outside in which there is Participation. This inversion is demonstrated by the row in which the denominators of 1 switch to become numerators of 1. At the inversion there is either 1/1 or .618/.618; in either case the value is 1. Corporeality is fractal, meaning the feedback dynamics (mass/inertia) that produce consolidation of matter are self-similar at every scale/dimension. 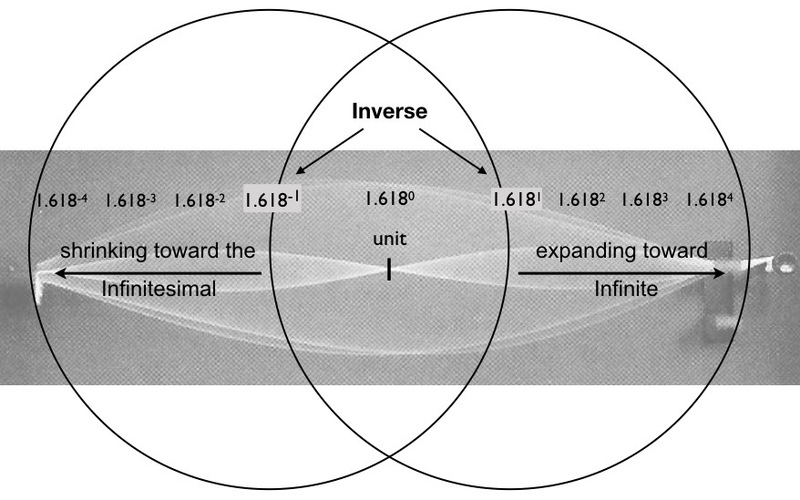 The inversion of fractions represents the endless dimensionality of every Particularity. Because the dimensions are like concentric waves encircling a pebble dropped into a lake, they intersect and encounter each other. Consciousness is a complete compendium of all encounters (interference patterns), regardless of scale/dimension. We add on a line. At the bottom of the PS we see an additive summation series. Take the two smallest numbers and add them to get the third value. Then take the second and third values and add them to get the fourth value, and so on, across the spectrum. The additive summation series represents this accumulation of data points throughout all of time, in other words: memory. Consciousness is appended, experience by experience. There is never a loss of INformation; it is holographically available everywhere/everywhen. Memories are accessible via resonance by anything/anyone at anytime. This number line accounts for both fractal Corporeality and holographic Consciousness across an integrated spectrum of scales/dimensions. 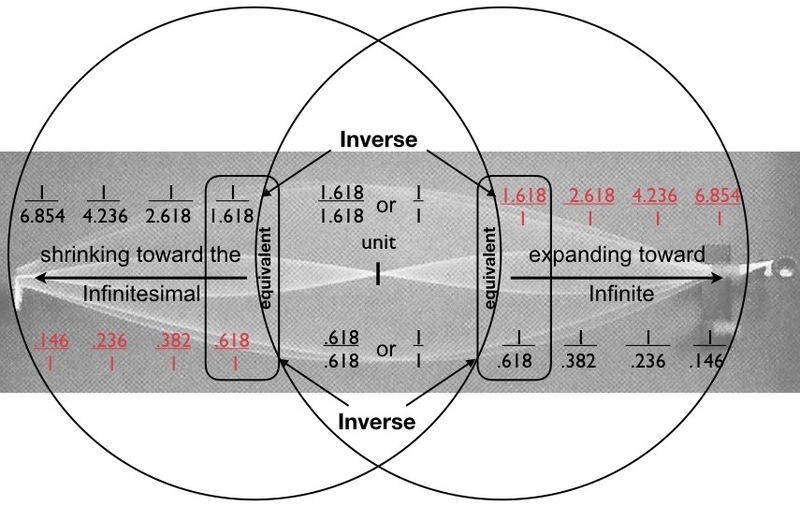 The inverse numbers, 1.618 (Phi) and .618 (phi), are the portals that allow divergence from the central unit into smaller and smaller inner dimensions and out beyond to dimensions growing greater and greater. This seamless progression runs in parallel to a linear additive progression, which connects end-to-end, from the first Pull/Inhalation/Inspiration to the final Push/Exhalation/Expiration. 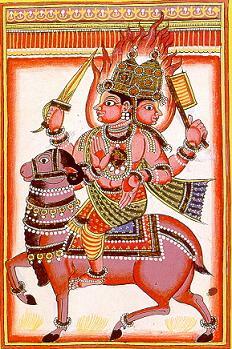 Below is a Hindu depiction of a two-headed warrior looking in opposite directions. This goes on while he is being carried forward in only one direction by a ram. Likewise, our days carry us forward from morning to evening, even while our attention is divided between outward stimulations and inward imaginings. Watch for this illustration to come back into play in the next chapter. We need to upgrade our logic to solve the problems of our day. Planetary remodeling is outpacing our preparation for the new world. If you wonder what is meant by “the new world” consider how much uncertainty exists nowadays regarding politics, economics, health care, housing, education, infrastructure, etc. In many places, the uncertainty extends to survival needs like water, food, power, shelter and sanitation. Crises are points of chaotic instability that produce both breakdowns and breakthroughs. Shake-ups bring shake-downs to light. To prepare our middle-schoolers for problem-solving on a higher level of consciousness, Quadernity’s Nature-Based Number Line can be implemented in schools right along with the currently-used number line. Preparations to give even younger students a head start can be read about in the attached aside: Learning to Love or Loathe Math. Below, the four deficits of the current number line, as described at the top of this chapter, are listed in the left-hand column. 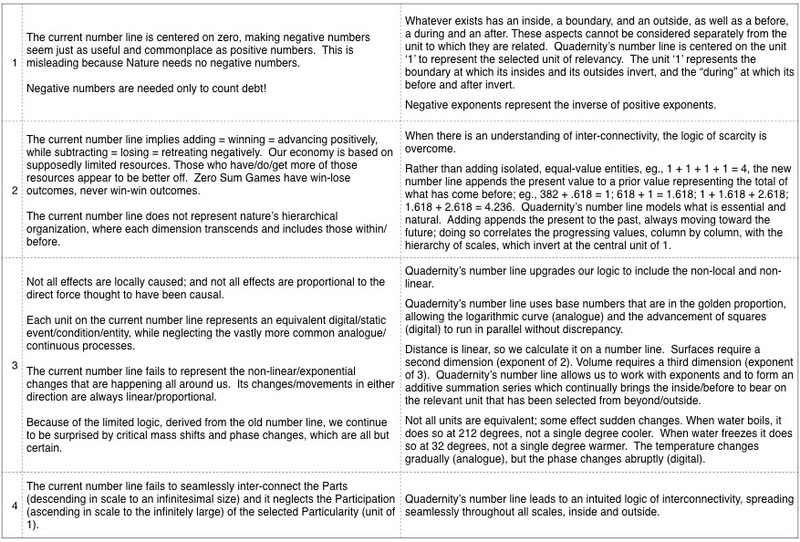 The right-hand column tells how the implementation of Quadernity’s number line alters and updates our intuitional logic for the 21st century. The next chapter, ties our new number line back to the enigmatic schematic in an unexpected way. Surprise! The Enigmatic Formula Was a Creation Story.